When Does Overwatch Season End? When Does Overwatch Season Start? Mei is very annoying to vs when you’re trying to kill her or trying to take an objective. Standing behind a well held up reinhard’s shield, using your Ice wall to block off choke points or enemy entrances for incoming flanks. 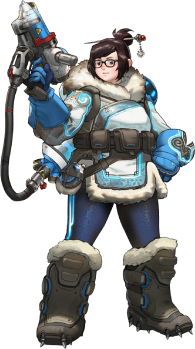 Mei counters quite a lot of strategies and heroes if used correctly. by timing it right you can use your Ice Wall ability to completely cancel out reinhardt’s ultimate. Another good mei counter is you can even throw your wall up in front of a torbjorn’s turret basically disable his damage in team fights. Mei is weak against Reaper because she can’t last long enough to freeze him. His damage output is very high and if you even get close to freezing him he counters mei by using Wraith Form. You can also play McCree to do really well agaianst mei, he has high damage and can easily go around mei’s wall if need to kill her. Zarya is a impactful counter to Mei, using the particle barrier completely stops the freezing and damage effect of her Endothermic blaster. Even while increasing her damage output making her really strong close range. A near full charged Zarya can run you down and quickly kill you, especially if you have no one to protect you. The cooldown on her barrier is alittle bit quicker than the cooldown on Cryo Freeze ability. Her only chance would to use an effective wall on you and run. Pharah: She can easily kill mei from a far and even up close, she can also keep her distance making he a very good mei counter. Junkrat: He has the capability to place down a trap next to mei while frozen, rendering her immobilized and can also output very high damage up close. Below A Select Hero Icon To View The Full List of Counters For That Specific Hero! View The Best Overwatch Hero Counters For Each Hero, who they are Strong Against and Weak Against. View The Best Heroes In Overwatch Using Our Tier List. Have a look at the competitive rewards players can earn this season. Easily Raise Your Overwatch Skill Rating In Competitive Play!